It’s 50 years since the Beeching report was published. 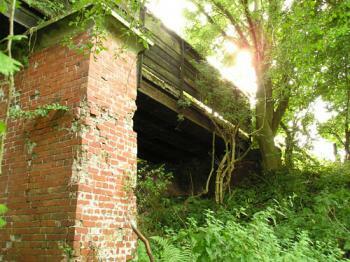 It led to the ‘pruning’ of the railway network, and the removal of some of its branches. If you prune a climbing rose severely this can encourage stronger growth. Doesn’t work like that with railway lines, clearly. Though in places it has left routes for walking and cycling, tidied and signposted. Seems a good time to steam through my collection of photos from walks in Yorkshire which included parts of those abandoned routes, and their surviving railway architecture. Near Market Weighton and Goodmanham, in East Yorkshire. Market Weighton was at one time well-connected. A line from York came into Market Weighton from the north-west, from Selby to the south-west, then heading out to the north-east towards Driffield. A line curved out to the east, to Beverley (and then on to Hull). The line itself – the ‘permanent way’ – obviously wasn’t permanent here. 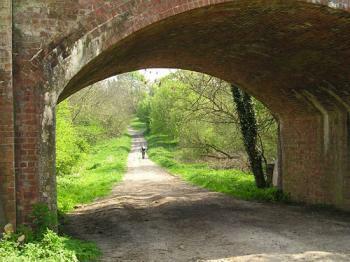 But the section of trackbed has been preserved from Market Weighton to Beverley and is now a cycle/walking route: the Hudson Way. 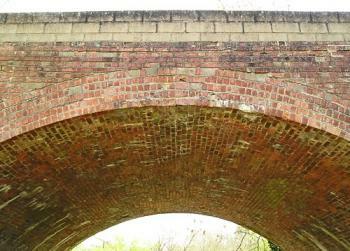 There must be thousands of these small brick-built bridges over railway lines. They’re everywhere, and seem ordinary. But look at that brickwork. Bridges made of metal or concrete can be constructed off-site and brought in to be lowered into place, as with the bridge recently opened in York over the Foss. These brick-built bridges must have been built on-site, as the railway lines worked their way through the land in the mid-19th century. Some have this kind of construction, carefully curved. 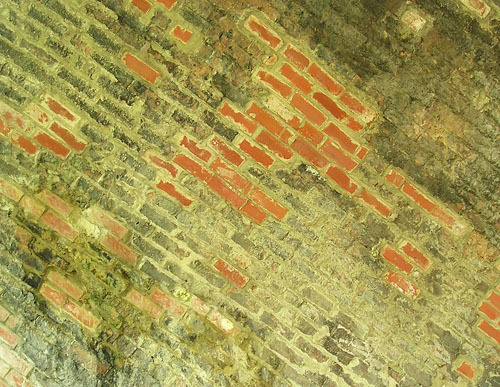 This isn’t a photo taken on a jaunty angle on purpose: the bricks really are set at this angle, moving up into the curve of the underside of the arch. 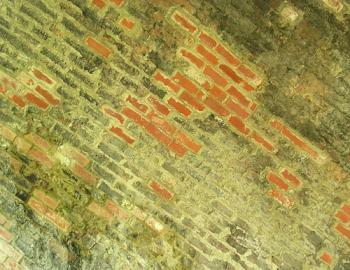 Some skilful bricklaying, don’t you think. 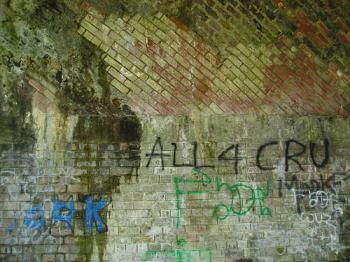 Graffiti-covered near Market Weighton, just as many of them are on York’s old closed lines. And at Wharram, one of the most interesting and varied ‘abandoned railway line’ walks takes you to the famous deserted medieval village of Wharram Percy. (Described some years ago on these pages, in Wharram and the Wolds) On your way to that more ancient place, remember to admire the old chalk works, and this now rather dilapidated bridge – reminders of our more recent history. Excellent photos. Seems such a shame to have removed most of the infrastructure at the same time. With a bit more foresight one wonders how many of the stations could have been kept open by reducing operating costs, such as reducing staff and removing redundant services on these lines. Then whether some of these routes could have been reopened/reinvigorated over time, leading to less reliance on roads… perhaps we’ll never know!